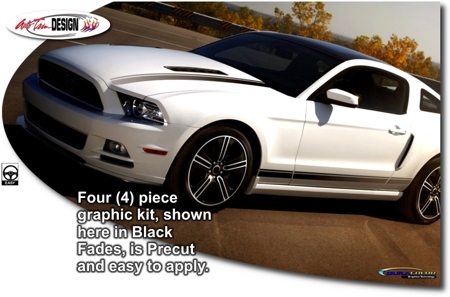 Set your '13-Current Ford Mustang apart from the rest with this unique GT/CS stylized* hood and body side Fade Graphic set. Available in four (4) Fade colors, precut graphic measures 2.5" (6.35cm) in height and is packaged with one (1) left and one (1) right side graphic set. Slight trimming required at wheel wells and door jambs. * While graphic is provided WITHOUT GT/CS badging, nothing prevents the owner from placing decorative decals/badging on top of these graphics which can be created and purchased locally. Note: While graphic kit was meticulously created in the GT/CS stylized size and overall appearance, actual fade pattern does not match. Factory graphic fade exhibits a distinct dot matrix pattern while our kit features a gentle, uniform fade.